With Numark's release of the Mixtrack Platinum DJ Controller the bar for entry level DJ control surfaces has been raised to a new high. Sporting some sleek lines and features normally only found in higher end controllers Numark whose brand has been a household name with DJs for decades has produced a great affordable option ($299) for DJs just in time for the holiday's. We took the Mixtrack Platinum DJ Controller out for a spin and found other than the limited capabilities of the intro version of Serato DJ that it is bundled with, the feel and responsiveness as a whole was spot on. We really liked the fact the displays were moved to the platters. The 1.75” displays indicate BPM, platter position, time remaining, key lock and pitch adjustment. Which makes it convenient for those that don't wish to take their eyes off the action. Some of the other features we liked were the 16 backlit touch-pads that can be used for loops and samples. They are large enough even our big digits could make swift use of them. Djs will like the fact they can switch between four decks instead of being limited to only two, thus allowing them more creativity on the fly. It would have been nice to have a full version of Serato, but the six sample packs with over 380 instrumental loops, drum kits, one-shots from Prime Loops is worth about $200 which more than offsets the cost of a full Serato license. 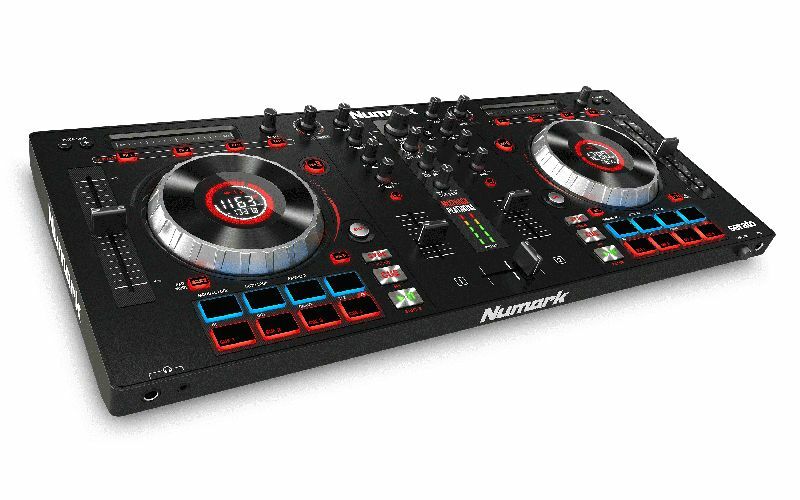 All in all the Mixtrack Platinum DJ Controller by Numark is a solid piece that will make newbie and seasoned DJs happy.